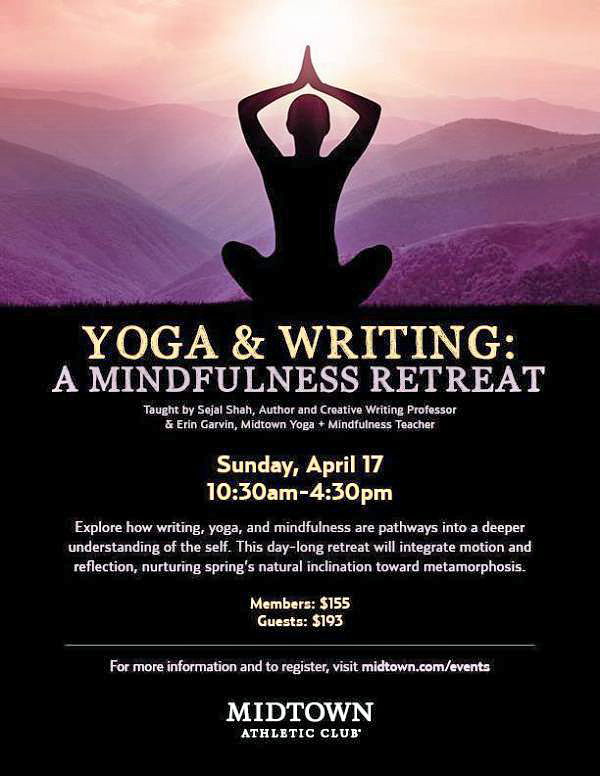 I’m looking forward to leading my next mindfulness retreat, a Yoga & Writing workshop with yoga teacher Erin Garvin at Midtown Athletic Club in Rochester, NY on Sunday, April 17th, 2016. Past participants’ comments have highlighted how valuable and restorative they have found these workshops. I love teaching them. 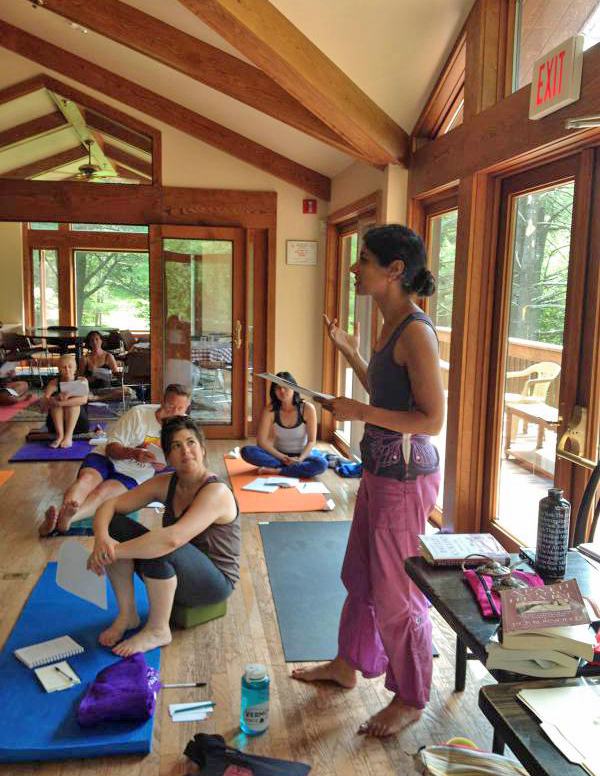 2016 is the fifth year that I’ve taught or co-taught a writing & yoga workshop. Our day-long retreat will integrate motion and reflection, nurturing spring’s natural inclination towards metamorphosis. All levels of yoga are welcome; no writing experience is necessary. For more information or to register, visit here. For more on my path of how I came to teach these workshops, click here to read an article in the UMASS Amherst alumni magazine. My friend, the wonderful nonfiction writer Wendy Call, and I discovered while on a self-styled writing retreat at her house in 2012 that stickers (stars and smiley faces) are as effective as they were in first grade for motivating ourselves to get whatever writing tasks done on a given day. Rewards! Stickers! They work. A few years ago, I returned from three months in India feeling completely lost. I was between jobs and had just moved back in with my parents. My friend Marijana suggested devoting a weekend to next year’s goals. We spent the weekend drinking tea, writing, eating, and making lists. Lists work. Before thinking about goals for the coming year, we took stock of the previous year. When I was a full-time professor, I dreaded writing annual reviews. However, I’ve come to realize the value in reviewing how you spent your time. Looking over your year helps you to collect what you have done, and therefore see what you still want to do. I’m aware of what I didn’t finish (thank you notes from our wedding, revising my first book, etc. ), but I lost track of what I did. Here’s my list. I hope it might inspire you to make one, too. Revel in what you did accomplish! Persistence / Book Review. I wrote my first book review last year; the publication I had in mind turned it down, but (this time) I didn’t let my writing sit in my hard drive. I sent out it out again, right away, and the review was published last summer. Writing & Yoga. I solo taught my first Writing & Yoga workshop. 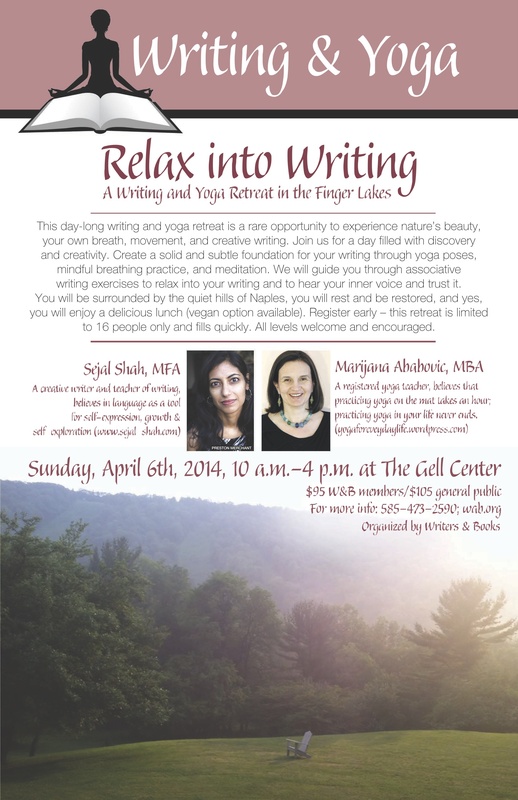 Though I completed yoga teacher training in 2009, prior to this workshop, I taught only the writing component. In 2015, I brought what I had been doing in my own yoga practice and drew from mindfulness exercises I had adapted to the classroom when I was teaching high school (sitting meditation, gratitude lists—see, I love lists—, freewriting, a choral reading of a poem, some stretching and gentle movement. Teaching Writing. I co-taught my first writing workshop with Creative Nonfiction Writer Gregory Gerard. I began teaching writing 20 years ago, but this was (incredibly) my first time collaborating with another writer on teaching a writing workshop together. I love how much you can learn from observing how others teach. Community Building & Literary Citizenship. I organized a December Literary Meet Up that drew fifteen or so writers, professors, teachers, & readers. Forging connections and community locally is important to me. Last fall I also learned how to create a calendar document in the ROC City Lit Meet Up Facebook group that I started two years ago (over 200 members now). It’s been rewarding to host a community calendar & virtual space that members can add to and edit — a central place to house the many readings and literary events in Rochester. Conference Presentation. I presented a paper on the lyric essay that was challenging to write at NonfictioNOW, a Creative Nonfiction conference held in Flagstaff, Arizona last fall. As I am no longer an academic, I wondered if it was worth the investment of time and money, but I met other writers, went on a much-needed hike in the Southwest, saw old friends, and learned from the panels. The conference energized me, for sure. Shout-Out! Hyphen Magazine asked 10 Asian American writers to recommend other writers / writing to read. Poet Matthew Olzmann picked out my essay, “Thank You.” Thank you, Matthew! What my 2015 Review clarified: I had not worked on my book in a consistent way—and that is concrete a goal for 2016—to finish it and move on to my second project. Sure, I was busy: I got married, moved, changed jobs, had caregiving responsibilities for my grandmother. Still, I had not made progress on a writing goal that is a priority to me. What are your goals for the year? Have you written them down? Do you have them in a place where you see them? Workshops can be an effective way to take time out to write down and to mindfully reflect on your goals and how you are spending your time. To have some extra structure and support around doing this work earlier, if you are local, I recommend signing up for Marijana’s terrific workshop, “Your Wild and Precious Life,” which leads you through personal writing, clarifying your goals, and creating action steps to reach them. Our goals are reachable if we keep them in mind and keep inching toward them on most days. (Baby steps. They work!) I wish us all forward movement and momentum on our goals & intentions in 2016. The current issue of the UMASS Amherst Alumni magazine has an article about the Writing & Yoga Workshops I’ve been co-teaching. Thanks to Laura Marjorie Miller for interviewing me and for writing the article. “There’s an ad from when I was a child that sometimes still runs in my head: Two great tastes that taste great together. Reese’s Peanut Butter Cups.